National University Gazipur Job Circular 2016 has been found my website http://www.bdresults24.net. Latest Jobs Circular of National University (NU) Bangladesh. 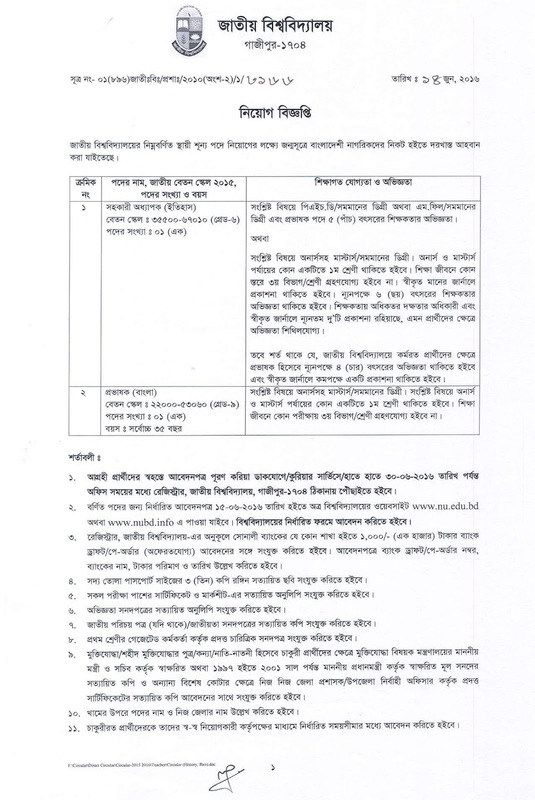 National University has published an employment recruiting notice for Assistant Professor (History) and Lecturer (Bangla). National University Job Circular 2016 is published on 14th June 2016 and application deadline June, 30; 2016. ■ Job Description: National University has been circulated two categories job recruiting Assistant Professor and Lecturer. ■ How to Apply: Apply with full Resume to Register, National University, Gazipur-1704. The intending applicants are requested to visit www.nu.edu.bd collect application form and may apply online with confidence by furnishing their detailed Resume with a recently snapped 3 passport size color photograph. National University Job Circular 2016 has given today. All NU Job Searcher can able to check and get update of National University Recruitment Circular. All details of Circular are found here. The interested person is requested to collect application from the University website www.nu.edu.bd or www.nuedu.info and send it to Register, National University, Gazipur-1704 through by postal service.